MRI and MRS are established methodologies for evaluating intracranial lesions. One MR spectral feature suggested for in vivo grading of astrocytic tumours is the apparent myo-Inositol (mI) intensity (ca 3.55ppm) at short echo times, although glycine (gly) may also contribute in vivo to this resonance. The purpose of this study was to quantitatively evaluate the mI + gly contribution to the recorded spectral pattern in vivo and correlate it with in vitro data obtained from perchloric acid extraction of tumour biopsies. Patient spectra (n = 95) at 1.5T at short (20-31 ms) and long (135-136 ms) echo times were obtained from the INTERPRET MRS database (http://gabrmn.uab.es/interpretvalidateddb/). 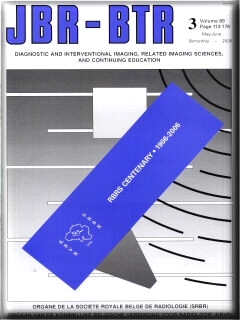 Phantom spectra were acquired with a comparable protocol. Spectra were automatically processed and the ratios of the (mI + gly) to Cr peak heights ((mI + gly)/Cr) calculated. Perchloric acid extracts of brain tumour biopsies were analysed by high-resolution NMR at 9.4T. The ratio (mI + gly)/Cr decreased significantly with astrocytic grade in vivo between low-grade astrocytoma (A2) and glioblastoma multiforme (GBM). In vitro results displayed a somewhat different tendency, with anaplastic astrocytomas having significantly higher (mI + gly)/Cr than A2 and GBM. The discrepancy between in vivo and in vitro data suggests that the NMR visibility of glycine in glial brain tumours is restricted in vivo. 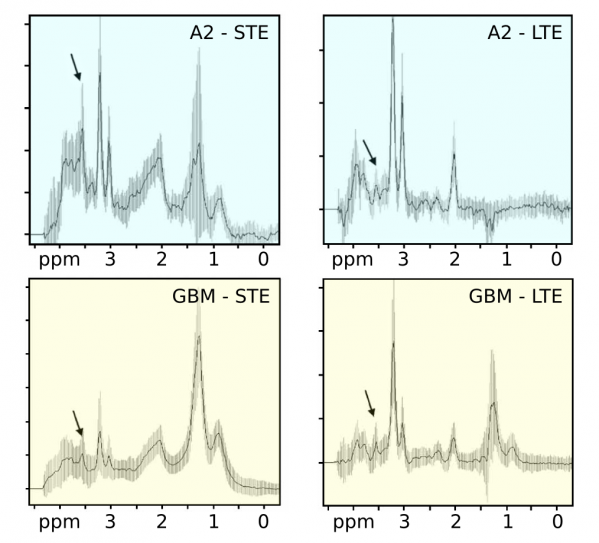 Low-grade astrocytomas (top row, A2) could be distinguished from glioblastomas (bottom row, GBM) by using the relative visibility of myo-inositol and glycine at short and long echo times (LTE vs STE) NMR spectra. © 2012 – 2017, Miquel. All rights reserved by the author(s) and Universitat Autonoma de Barcelona except for texts and images already copyrighted by third parties (e.g. journal publishers) and used here under the fair use provision.